Now that, people, is how you end a freakin TV season — with a conspiracygasm! Last night's season ender of Person of Interest confirmed that this show is one of the few places you'll find action-packed, thoughtful science fiction on television. And this finale — what an amazing payoff. All season, POI kept multiple, interlocking conspiracies in play, and last night managed to bring them all together in a shivering house of cards whose structure made perfect sense even as it collapsed. Characters, including the Machine, developed in fascinating ways; and we got a seriously cool new Big Bad to kick our asses across the yawning cliffhanger known as summer. I was still reeling from last week's superlative episode, which returned to the root of the show's inspiration: The idea that the government intelligence community is so out of control and broken that it needs to be placed under surveillance by secret vigilante good guys. When a good NSA agent is threatened with death by his own colleagues — just for "asking questions," as Finch repeatedly puts it — we're in POI's sweet spot. The episode ended with an incredible shoot-out montage, set to David Bowie's song "I'm Afraid of America." Having brought us back to the show's premise, which you could describe as superheroism in the age of Anonymous, we were all poised for this week's revelations about the Machine and the people who guard its secrets. But first, because POI never does anything halfway, we had other conspiracies in play that needed to be dealt with. When it comes to the organized crime and cop corruption stuff, this show really had to win me over. Every time we'd switch gears from high-tech surveillance stuff to low-tech head busting, I felt like I had genre whiplash. But as the subplots about Elias and HR unfolded, I realized why this show needs gangsters as well as hackers. This is a show about crime. Like the Machine, POI doesn't make a distinction between street crime, organized crime, intelligence agent dirty tricks, and political corruption. They are all crimes, and their perpetrators need to be stopped. I love the idea that our heroes hit back at the NSA as often as they do the Mafia. There's a kind of democratizing logic to their vigilantism. After a season of shoving working-class detective Fusco into the HR fire, Reese finally let the guy turn those corrupt shitbirds over to the Feds. In fact, the Feds actually see some of the HR dirty work going on right under their noses, as HR tries to assassinate our number of the week, Turing, even as the Feds close in on Reese. There's a great scene where the cops and Feds are all together in an emergency response center, surveillance going full blast, and the Feds catch a glimpse of one of the HR guys cutting a wire to a surveillance camera while ordering his boys to kill the hell out of Turing. Part of the payoff here was also that Fusco and Carter finally discover that they've both been working for Reese and Finch — and together, they bring down HR by sending everything Fusco knows to the Feds. 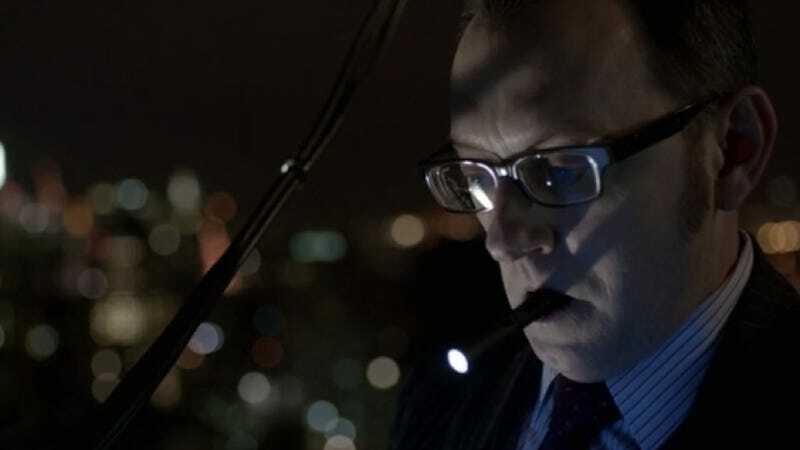 It will be great to have Fusco and Carter as a team now, since the whole "they are both on their mobiles with Finch at the same time" thing was kind of working my last nerve. So: The HR conspiracy is now shut down, people. No Losty dragging it out. Well done, everybody. Pivotal to the emergency response center scene is Finch's last-minute tech trick to help Reese and Turing escape. He somehow hacks into the DHS's system to take over local cell phone towers, and jams everybody's signals except his own. Suddenly the Feds can't communicate, and neither can the HR guys. OK fine, except WHY WOULD THE FEDS BE USING CELL PHONES TO COORDINATE THEIR TEAMS. Just saying. It was still a good scene but that threw me out of the action a little. Ingram's buddy Alicia, who was in on the deal to hand the Machine over to the Double Seekrit Intelligence Agency, has been spying on Finch since last week. Why the hell is she back? We found out this week — sort of. She's convinced that the Machine is as powerful as "God," as she puts it, and that it's causing incredible destruction. She's come to find Finch because she wants him to help her shut it down — and she's been trying to find him before other people who know about the Machine get to him first. Unfortunately, Root kills her before she can explain more, but we actually learn quite a lot from her crazily awesome monologue to a terrified-looking Finch. 1. Alicia, along with some number of other people who know about the Machine (and we know there are only 9 people who do, including Reese and our hapless NSA agent from last week) know that Finch is still alive. So his cover is blown. 2. There's good reason to think that the Machine may be doing harmful things, though we don't know what. 3. Alicia was probably working with somebody else, or at least hoping to hand over intel to somebody else, given that she was gathering photos and film of Finch. No need to do that if she's gone completely rogue. I want to call this a payoff simply because we do figure out what Alicia is doing snooping around Finch, though of course her death raises more questions than it answers. Though Root kills Alicia, it's not clear to me that Root is the person that Alicia is referring to when she says, "It's lucky I found you first." My guess is that she has no idea who Root is — Root is your basic high-level cybercriminal — and that Alicia is talking about her evil colleagues in Intelligence. And now, my favorite part: The Machine finally came to life at the end of the show. All year long, I've been wondering whether the Machine would become its own character, and it finally did. But before I get ahead of myself, let's talk Root. So Root was a favorite villain from mid-season, a hacker so slick she could make even Finch cry a little bit. She's a mercenary type, out to get whatever she can, willing to do anything to pop a machine full of secret data. And as we saw in this episode, she's as much a master of social engineering as she is technical hacking. She hires HR and puts a hit out on herself — well, at least the "self" she pretends to be when she creates a false identity as Caroline Turing, super therapist. After snooping around Finch and Reese, she's figured out that the best way to find them will be to turn herself into a number of the week and wait for rescue. Which she does. And of course, Finch and Reese fall for it, hook, line and sinker. Finch doesn't even realize the deception until Root has murdered Alicia right in front of him and given the old "mwhahaha I did it" speech. Even the kickass Zooey doesn't figure it out until she sees the self-deleting computer that Root left behind. So now Root has Finch in her clutches, and presumably it's because she wants access to the Machine. Which — I'm not sure if Finch's access to the Machine is a two-way street. It gives him numbers, but as we learned last week, it was Ingram who built the Machine's backdoor. I'm not sure if Root is going to be able to get much out of the Machine just by holding Finch. That said, as the episode ended, we watched as the Machine took direct action to help its missing maker. Reese goes out to the area where Finch received mysterious telephone calls on a pay phone, and looks straight into the Machine's CCTV eye. "He was working for you," he says to the CCTV. "And now you've got to help." We watch from the Machine's POV, as it ponders its options. And then the pay phone rings. Right after Reese picks it up, we fade to black. That's how a cliffhanger is done, people! I love that we're finally watching the Machine take initiative based on simply responding to Reese talking to it on a CCTV. Is the Machine evolving, or has it always had this ability? And will it be able to protect itself from Root? I am seriously excited to see what lurks in season two!